"It has its limitations but for simple business travel it will certainly suffice." The canals of Venice, the coliseum of Rome, beautiful lake Como and the leaning tower of Pisa. With attractions like these it is no surprise that Italy is the 5th most popular tourist destination in the world. But if you really want to enjoy the sights and experiences of Italy it helps to master at least some basic conversational skills. One course that promises to teach you those skills is Berlitz Italian. Berlitz has been teaching its students how to speak Italian for more than 130 years. With Berlitz Italian they have taken that accumulated knowledge and created their own multimedia language learning course. But how effective is it? This review seeks to answer that question. Here you will find what features have been included in this course, as well as the advantages to using the Berlitz system. You will also discover some important limitations of this software learning course. 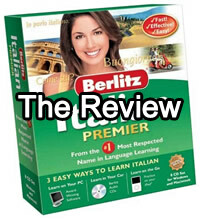 Finally at the end of the review I will explain who I think will most benefit from purchasing Berlitz Italian. Italian language learning software - The Berlitz course is primarily computer based. These computer lessons include video, flash cards, games, audio conversations and speech practice. Audio CDs - Berlitz Italian comes with four audio CDs. These are designed to be used in your car so that you can learn while you commute. They can also be copied and listened to on your iPod or other MP3 player. iPod exercises - The third major component of the course are the iPod exercises. These allow you to practice your vocabulary word list on any MP3 player. Berlitz Italian costs $39.95. This includes a six month satisfaction guarantee, during which if you are unsatisfied for any reason you can return the language course for a full refund. Tailored to your specific needs - One of the best aspects of the Berlitz Italian course is that it is easy to customize it to your own personal learning needs. You can create word lists of Italian words that you want to practice. You can also slow down the conversation, so that you can hear in detail what the actors on the software are saying. Perfect for learning on the go - Another standout feature of the Berlitz Italian course is how well designed it is for mobile learning. In addition to the Audio CDs and the iPod exercises the course also comes with flash card software for Palm and Pocket PC. Berlitz Italian is well suited to those people who don't have a lot of time for study and like to multitask. Great price - Perhaps what sets it apart from its competitors the most is the price. At the $39.95 this is very inexpensive for a multimedia language course. For example Fluenz Italian is $398 and Rosetta Stone Italian is $374. For this type of language course only Rocket Italian is comparatively priced at $99.95. All three of these courses are more extensive than Berlitz Italian but if you are on a budget but still want a quality language course then Berlitz is a good option. Excellent guarantee - Berlitz offers the best guarantee of any language learning course that I have seen. You have a full six months to try out the course, and if you are unsatisfied you can return it for a full refund. The instructions for how to take up this refund are included inside of the box. Useful and fun videos - The conversational video scenarios are fun to watch and are specifically targeted toward travel related scenarios. Berlitz has employed native Italian speakers as the actors for these videos, which make them a great way to learn how real Italians speak. You can pick up on all of the nuances and correct pronunciation of Italian. The ability to slow down the conversation to a pace where you can understand exactly what they are saying is also very useful. No enough supporting material - This program is being promoted as being beginner friendly but lacks supporting material that would make it easier for a new learner to use. The inclusion of a follow along written booklet, would make the lessons much easier to use. To some degree this is made up for by the ability to analyze the video theatre lessons, word for word in the reading section of the software. Problems with the rebate - Many previous customers have experienced problems with the rebate offered on Berlitz Italian. This is handled by Nova Corporation and is no reflection on the quality of the course which is produced by their subsidiary Berlitz. However it is something to be aware of if you are planning on claiming the rebate. Uninspiring Games - Another let down in this course is the quality of the games. The inclusion of the games would at first glance seem to make the course more enjoyable. But the games, such as crosswords, are repetitive and can quickly become boring. Lack of Clear Structure - Berlitz Italian lacks the clear structure that other courses such as Rocket Italian and Rosetta Stone have. It is difficult to know which section of the course you should start with. It is also unclear how much progress you are making through the course. A more clearly defined structure would significantly improve the value of Berlitz Italian. To be honest, Berlitz Italian is in my opinion not the best Italian language course available. Rocket Italian is more extensive, considerably better structured and not that much more expensive. At the high end of Italian language learning market Rocket Italian is far superior course to Berlitz Italian. However if you are on a limited budget but you still want a language course which will teach you the conversational fundamentals of Italian, then you could do far worse than buying Berlitz Italian. This language course has its limitations but for someone visiting Italy for business or pleasure it will certainly suffice.